The Ethiopian-Eritrean border war of 1998-2000 not only marked the outflow of large number of Eritreans to Ethiopia but also the transformation of the porous border into a wall that obstructed established movements of people and goods (Dias 2012). Regardless of the physical and political barriers that exist among the two countries and the Eritrean government’s policy towards those caught trying to escape, many cross the border surreptitiously and found their way to the border camps in Ethiopia. Unfortunately, the moment of departure to en route flight- characterized by the presence of security forces, unpredictable outcome of crossing the militarized border and the subsequent camp life – anticipated with varying degrees of unease as a result of unpredictable future and protracted situation, all make the social environment of the refugees uncertain. Based on the experience of Eritrean refugees residing in Mai aini refugee camp in northern Ethiopia, this study was proposed to understand how refugees perceive, experience and deal with uncertainty during their flight, and while living inside the refugee camp within a limited and restricted context. This fieldwork was conducted from 6 to 24 October 2017 in Hitsats refugee camp, an Eritrean refugee camp that was selected as an additional research site to the main research site, the Mai aini camp. Field activity focused on the context and sources of uncertainty during refugees’ actual exilic process and their experience in the camp they lived. The fieldwork was financed by the French Center for Ethiopia Studies (CFEE), and the NORHED funded PhD project – Borderland dynamics in East Africa. Ethnography was the main method of knowing and production of knowledge. In an attempt to generate a rich understanding of uncertainty and its dynamics during refugees’ en route flight and while living in the camp, various strategies and techniques of data collection were employed, including observation and life history interview. Through observation, a type where I was a moderate participant, I was able to watch how refugees interact and also gained an emic perspective into their lives. Life history interview, which is valuable data gathering tool in refugees contexts (Powles 2004), gave me the opportunity to portray the lives of my interlocutors, to map how their experiences change over time, and to link their experiences with the cultural, social or historical contexts. Using narrative was also advantageous in reducing the power asymmetry, as it gives my interlocutors the autonomy of narrating their own life history rather than responding to a predetermined set of questions (Ecke 2013). As such, I was able to make sense of the wider and more complex milieu of refugee’s experience, going beyond the shiny surface of the regularly politicized discourses of the camp. Although data collection and analysis are ongoing, the following paragraphs highlight some preliminary findings from the study. Bordering Eritrea in the south, Ethiopia not only hosts large number of Eritrean refugees, it is also a transit hub for many Eritrean migrants. The arrival of Eritrean refugees in Ethiopia started with the brief Ethiopian-Eritrean war of 1998-2000. Since then, the Government of Ethiopia upheld an open border policy towards Eritrean refugees and grants them refugee status on prima facie basis. These refugees usually found in the Northern region of Ethiopia, in a region that borders Eritrea and Sudan. Hitsats is one of the four Eritrean refugee camps located in Tigray National Regional State, in northern part of Ethiopia. 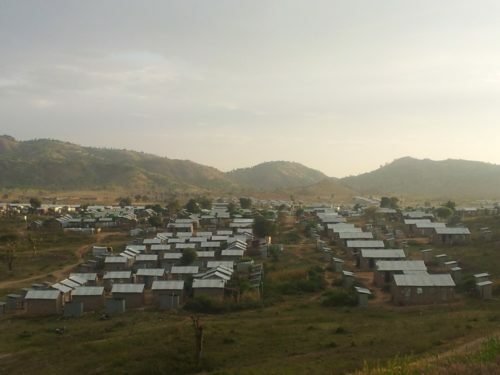 The camp is located in Hitsats Kebele in Asgede Tsimbila Woreda under Shire zone coordination office, about 1,130 km north of Addis Ababa. 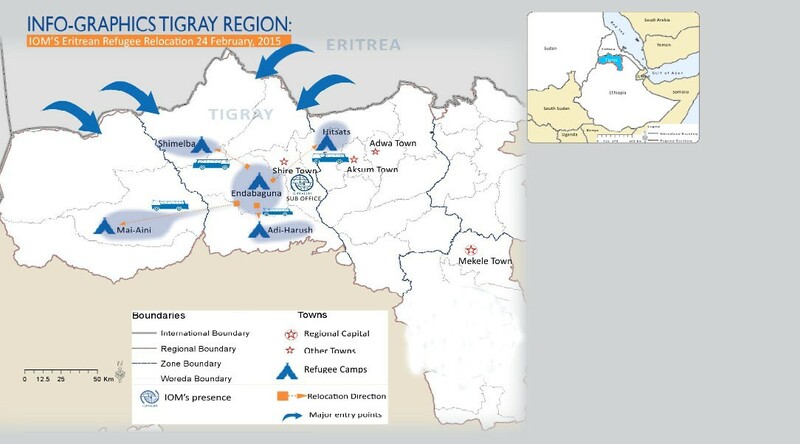 Established in May 2013, it is the newest of all Eritrean refugee camps in Tigray regional state. The area is extremely hot and arid. With its straight rows of concrete block houses, covered with zinc roofs, the camp emerged defying the surrounding countryside as well as the small town of Hitsats. The total area of the camp covers approximately 2,104,000 m2 (210.4 ha). There is no physical barrier that surrounds the camp, except for the psychological as well as the environmental barriers. 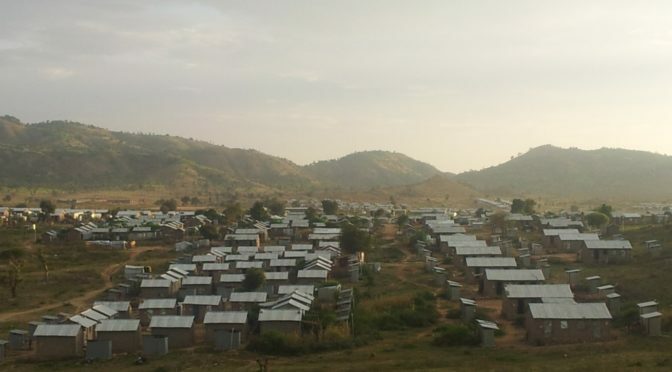 Divided into blocks and sections, there are about 1,333 permanent shelters, a primary school, temporary health center and vocational training center in the camp. An average of five to eight refugees lives in each concrete block house which is 10 ft x 10 ft. With commonly observed one or two beds made of mud, the shelters serve as a bed room, where female and male refugees are forced to share the mud beds; as a kitchen, where they prepare their meals and kept their utensils; and as a store, where they kept their inadequate rations, and clothes. So far, the camp accepted 58,881 refugees. However, the actual number of the population is much less than this figure. Refugees leave the camp for different reasons such as the out of camp policy, educational opportunity, medical referrals, or due to some process of resettlement. However, irregular secondary onward movement from the camp is largely responsible for the stable outflow. In fact, a significant number of the refugees do not remain in the refugee camp. They use smugglers, who involve in secondary onward movement, to cross into Europe through Sudan, Libya and Egypt. The close proximity of the camp to the small town of Hitsats, allow an ongoing interaction between the refugee and the host community. However, living inside the refugee camp marks one’s life and distinguishes ones position. Refugees do not have a work permit and therefore formal employment in and outside the camp is illegal. 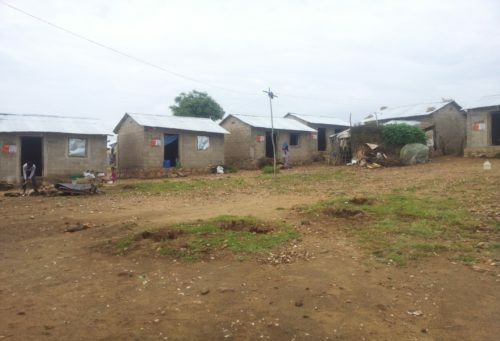 Despite the fact that the camp is relatively close to Shire, unlike other camps such as Mai aini, where there are small business centers such as cafes, TV houses, photo studios, barber shops, etc. that are allowed or tolerated and owned by refugee businesspersons, business activity is limited in Hitsats. The limited commercial activity, infrastructural underdevelopment, harsh environmental condition and high prevalence of malaria made Hitsats the least favorable camp to live in. As the largest population of the camp are those displaced because they were fleeing compulsory military service and other forms of political repressions, the greater part of the population is young. The camp also hosts unaccompanied separated minor children. Thus, one cannot find the social structure in most refugee camps, which are mainly comprised of women, children and the elderly. During the day, men and women spend their time in domestic work; women and men queue for water, medical care and paperwork to get a pass permit. It is also common to see many spending their time simply playing cards, drinking coffee, or chatting in small groups. These are part of the daily routine, largely observed inside the camp. Unlike the newly arrived refugees, those who had stayed longer inside the camp feel hopeless and entrapped in a cycle of despair with no access to employment and without future, fraught with uncertainty. Uncertainty at the initial stage of refugees’ flight can be divided as pre departure and en route uncertainties. Factors that put my interlocutors in uncertain condition start while they are within Eritrea before their actual departure. Under this condition, there is no actual ongoing conflict, but people are anguished with brutal military rule, economic misery, corruption, and human right abuse. It is also a condition where there is mass out migration of people, family and friends, out of the country – unable to pursue their own life plans and meet social expectations and responsibilities (Treiber 2014). These were the main factors that created uncertainty among the majority of my informants before their departure. Trapped in a circle of despair, the decisions to move might reduce uncertainty than staying. On the other hand, there was en route uncertainty, manifested because of predicaments along the way during the actual exile. Particularly, as the result of the existing political situation between Ethiopia and Eritrea, fleeing Eritrea is considered as a treason. Ways and means were usually limited and restricted. There is a high presence of security forces and a ‘shoot to kill’ policy along the Eritrea side of the border and the militarized border which is guarded on both sides. The terrains of the region are difficult to maneuver and there is the fear of sexual abuse. Although refugees heard rumors or knew what has happened to other people, and what lies along the border, there is limited access to clear or definite information. The environment was dominated by rumors, ambiguous accounts and horrific speculations. Thus, lack of reliable information, not knowing where one will end up and what will happen along the way, put my informants in a very uncertain condition during their en route flight experience. Specific experiences of uncertainty during refugee’s flight were marked by the irregularity of unfolding events, the experience of violence as well as the need to take risks under precarious situations. So, the type of uncertainty experienced varies depending on the various stages of flight (Horst & Grabska 2015), at times liberating, at other times debilitating. The fieldwork met the immediate plan of the project and helped in directing the next move. The subsequent phase of the research will continue to look into how refugees’ tried to govern through uncertainty – Whether they deliberately navigate the precarious terrains that surround them or remain passive. Along similar line, “Is the refugee camp a homogeneous space of ‘bare life’ with a homogeneous life? Or a place where different life projects are articulated? Or a multi-dimensional space of ‘acting’ and ‘being acted up on’?” also needs further investigations. To do this, the data collection- at various levels and from different sources, analysis, and the write-up of findings will go hand in hand, focusing on issues inside and outside the camp and, connecting the local with the global, thus adding depth to the research. According to UNHCR Global Trend (2016) 165,600 Eritrean refugees were hosted by Ethiopia. The camp was selected as additional research site from the existing refugee camps in the region for different reasons. Mainly, part of the research focus on newly arrived Eritrean refugees and Hitsats was recommended as a camp which currently accommodated large number of newly arrived refugees from Eritrea. In addition to this, unlike the other Eritrean refugee camps in the region, which seems relatively stable, there is high onward mobility from this camp. Humanitarian agencies and ARRA (The Administration for Refugee and Returnee Affairs) employed refugees in different positions for example as translator, social worker, teacher at primary school, etc. These employees do not receive wages but receive a small ‘incentive’ payment for their work. These unaccompanied refugee children are children who have become separated from their parents and have arrived in the camp by themselves. A pass permit from the camp enables the refugees to carry out their business, to conduct pilgrims. It is a means that creates social interaction between life inside the camp and the outside world. Horst, C. & Grabska, K.(eds) (2015) Introduction: Flight and Exile -Uncertainty in the Context of Conflict-Induced Displacement, Social Analysis, V59, 1, 1-18. Treiber, M., (2014) Becoming by moving: Khartoum and Addis Ababa as Migratory Stages between Eritrea and « Something ». In Mustafa Abdalla, Denis Barros Dias and Marina Berthet. (eds.) Space in Movement: New Perspectives on Migration in African Setting. Koln Koppe.